Break out the BBQ, summer has officially arrived! And to make sure you don’t get caught playing “ketchup,” we’re sharing festive and fun Fourth of July party ideas to help you celebrate in style. Plus, we’ve teamed up with Bonjour Fete to give away the ultimate red, white and BBQ party pack, chock-full of all of your Fourth of July needs! Read on to see how we created the perfect summer picnic and to find out how you can win an amazing assortment of party goodies. That’s right fellow Americans, all this can be yours—just add cookies! Speaking of cookies, these corn on the cob, hotdog and hamburger sugar cookies from Starbakes require zero grill time and are sure to satisfy even your vegetarian friends! It’s like we always say—sun’s out, buns out! No pattern screams Americana quite like gingham, so we’re hooking you up with both red and white and blue and white color schemes! The eco palm leaf plates and birch wood forks will keep your party environmentally-friendly, while the star-spangled straws and blue-striped cups will have you sippin’ in style. Cheers! 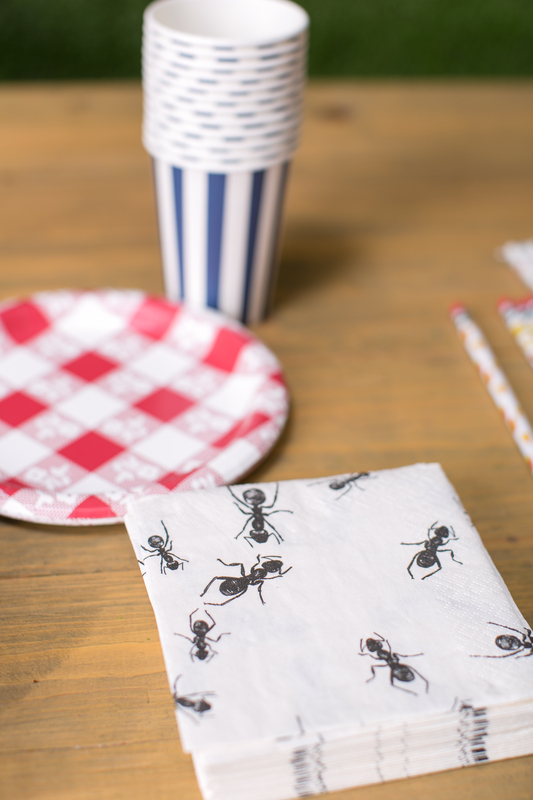 Even the ants will come marching one by one to see your party setup with these whimsical napkins! We nabbed these tasty cheeseburger invitations from Paperless Post—easy peasy, extra cheesy! Who doesn’t love Fourth of July fireworks? Keep it kid-safe with these red heart sparkler wands—your dog will thank you too! Another highlight? These favors. We have to say they’re pretty on point—ball point, that is. We also found the holy grail of junk food. These french fries are fat-free, calorie-free and just plain free if you win ’em. You’re welcome! And because no BBQ would be complete without all the fixings, we made sure to include jumbo-sized ketchup and mustard bottles to top off the table. WIN IT! One lucky Project Nursery reader will win a Red, White and BBQ prize pack including one package of everything pictured below (gold and silver sparklettes, eco wooden forks, ants picnic napkins, blue napkins, star paper straws, red gingham plates, eco palm leaf square plates and navy stripe cups), plus a $50 gift card to Bonjour Fete (a $101.75 value). This giveaway is open to US residents only. I’m super excited about July 4th, my family will have an Asian Tour for the first time.